Tethering: buying a 3G phone just to tether? I have an unused Nokia 3G phone at home. I wonder if there's a tethering solution for it? The GoPhone angle is interesting. In any case, I need a tethering solution. I gather I'm not alone! I suspect that sooner or later Apple will sell a solution with the iPhone and it will cost at least $30/month to use it with AT&T. I'm working through my migration from Lunarpages to Dreamhost. I'll have a series of posts outlining what I learn during this migration; it seems like the kind of topic that could sue some sharing. The first step in my migration was to sign up with Dreamhost. I googled on "dreamhost coupon" and found a code that gave me $50 off, so my 1 year contract cost $70. I have 2 months left on my Lunarpags contract so I can take my time on the migration, transferring one domain at a time. I haven't told Lunarpages I'm leaving of course; there's no need to muddy the waters. If they care they'll figure it out from the domain transfers anyway. The next step is to move my files. I figured I'd learn about SSH/Telnet and tar balls -- but Lunarpages doesn't includes SSH with my account. Lesson: Confident hosting vendors, like Dreamhost, provide services that make it easy to switch -- like Telnet/SSH on every account. You want a confident vendor. So I'm doing the old FTP down and up procedure. Tedious, but I have the time. Once the files are on Dreamhost with a temporary server name I've verify things are working. Then I'll be ready to switch domains. Update 8/28/08: I figured out a better way. DreamHost has a web based FTP tool, so you can ftp from the old domain to DreamHost. Of course one could always do this from Telnet/SSH -- but I'd forgotten about command line ftp. It's been a long time since I've done that. Update 8/29/08: Well, the net2ftp web tool was a bust. I couldn't see how to get it to move files from LunarPages to DreamHost -- and there's no documentation. On the other hand, Lunarpages allowed me to download a tar.gz archive of my entire site with one click. Kudos to them, I'd no idea that was possible. So now I'm FTPng it to Dreamhost and I'll see if I can expand it there either from the Net2ftp web interface or by activating my SSH access. Go to Lunarpages Backup control panel and click link to download a backup file (tar.gz) of my Lunarpages site. FTP the 640MB archive to my DreamHost directory. Enable Bash SSH access on DreamHost. Download and install Tunnelier for Windows (I did this from my XP machine). SSH to DreamHost and run "tar -xzf backup-faughnan.com-8-29-2008.tar.gz"
At this point everything had been restored, but they were in the wrong folder. So I had to move them. This is where I really missed tools like Norton Commander, never mind Finder or Explorer! cd mydirectoryname: change to mydirectoryname. Also use cd .. to move up. If you want to switch to DreamHost my coupon code of KATEVA will get you the maximal coupon discount of $50 off a 1 year subscription. This is a known design or manufacturing problem with recent generation Digital ELPH cameras. A handful of negative reviews on Amazon tells us the SD1100IS is infected. I wouldn’t buy one at any price. I would only look at purchasing an ELPH released within this month’s batch. Scoble follows in my footsteps. He's begun using the Google Reader Share function to create a feed made up of items he likes, along with his annotations. Google Reader shares are an automated form of metablogging, but concerns about copyright are addressed -- the post is made up of the original article with an annotation. These shares are a feed, so one can subscribe the shares. I subscribe to Scoble's share -- its good stuff. Escape from Lunarpages - what next? I've hosted a set of web pages and domains through Lunarpages. The support and quality hasn't been great, but not so bad that it was worth switching. Recently, however, they went over a cliff. I've been through two significant domain related screw-ups with them in about six weeks. This was the reply to the latest problem. Right. Not only is the reply pretty annoying (no date? ), but also the problem occurred with no changes made to cpanel. So I'm not happy with Lunarpages -- but are there really better choices? Could I, for example, find a reasonable file hosting service combined with a registrar with user configurable CNAME settings? Well, yes, there's Google Apps/eNom -- but that won't work for the domains I already use. Problem is, none of them are too appealing. Seems the entire business is troubled - it looks like 90% of the customer base are name squatters. That's not a group terribly interested in customer service. So can I find the next best thing to Google -- a quality hosting service that uses eNom? Well, Lunarpages doesn't use eNom, but there 7th on this list. Hmm. Tough bunch! Dreamhost is an ICANN approved registrar. They include webdav support, optional VPN services, unlimited subdomains, Jabber instant messaging, custom MX configuration, custom DNS configuration including CNAME revisions ... Not to mention a very elegant and clutter free web site. So things have changed since 2004. 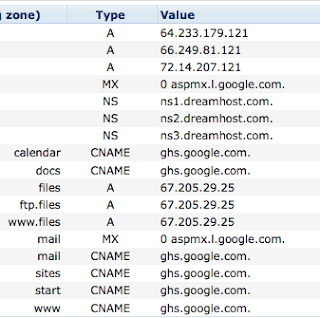 What happens today when I search on the string Lunarpages Dreamhost? I find posts like this one and this one. I suspect Dreamhost has their own issues. This is a tough business, but it looks like I'm not the first Lunarpages customer to look to Dreamhost. I think I'll try moving one of the problem domains and see how that goes. Update: Dreamhost was started by three Harvey Mudd undergrads. As a Caltech alum I actually know of Harvey Mudd -- it's an honorable sort of place. Update: Even better. Dreamhost offers free hosting for non-profits and they mention use of Google Apps as a deployment option. Perfect. I'll move the Google App based non-profit site I help with first and see how well Dreamhost does. That will eliminate one of domains Lunarpages messed up and I can transfer domain ownership to the non-profit at the same time. Once we see how that goes I'll post with further comments. Update 8/2/08: Today Lunarpages misconfigured their server and associated an xml mime type with all my pages installed a security update that interacted with changes they'd made to my .htaccess file and took all my pages offline with an obnoxious XML error message. None of them render. I'm now relocating to Dreamhost; I'll have some future blog posts about the migration experience. I'll move all the files first, then the domains last. I have to think about domain migration sequence. Update 8/29/08: If you sign up with DreamHost and use my promo code, you get the maximal $50 1st year discount. The code is KATEVA. ...there are quite a few to-do items on our list. First, the desktop app will see some long awaited improvements that will push it closer to 1.0. .. we will keep you updated on our progress via Twitter. As is true of every iPhone developer except Missing Sync, the sync is network based. iPhone developers do seem to love Twitter. I think the problems describe here are a variant of the “unknown error” issues I’ve run into following a difficult iPhone restore procedure. It smells to me like a mismatched DRM-motivated unique identifier. I’d recommend trying ..
Expect to lose all app-related data from your phone. Mount phone, don’t allow sync. (If you hold home button on connection it won’t sync, I always disable auto sync). Go to tab for applications, switch to selective sync, uncheck problem app. Go to tag for applications, check the problem ap. If that doesn’t next up is to restore the phone from a previous backup. Restore from backup. Expect to lose new data. Restore takes a LONG time, you have to resync music, etc, you lose all passwords, some config settings. Bento doesn't seem to get much respect. I just played with it. Bento lets me edit task, calendar and address book data in a database framework. It brings a lot of power to underpowered apps; Bento + iCal/Address Book is much closer to Outlook. I'm migrating my main machine to 10.5 in a few weeks. I suspect I'll buy Bento after that. The iPhone calendar has a design flaw. I ran into it because I subscribe to a calendar feed from Toodledo, and tasks due today are represented as all day events. When you have lots of all day events, the display area for the calendar fills with all day events, and the hourly events aren't accessible. The design flaw is the logic for partitioning scheduled and all day events, and the failure to support scrolling of all day events. I've been using it with Toodledo. I'd considered a switch switch to Remember the Milk but Toodledo tech support helped me with my major concern -- the ability to apply operations to sets of items. The combined cost of ToDo.app ($10) and Toodledo ($17) together is $27 - a good fraction of MobileMe. Too bad Apple hates us. ... it’s in creating and organizing tasks that Todo really shines, offering many more features than Zenbe Lists or any of the basic to-do apps I covered a few weeks ago. As with other apps, you can create multiple lists of tasks; you add new lists and tasks using the plus (+) button at the top of the main lists screen or any individual list screen, respectively. When viewing a list, tapping on a task’s circle marks the task as complete; depending on your settings, completed tasks disappear completely or are moved to a Completed section at the bottom of the current list..
Tasks can belong to only one list/category/tag. 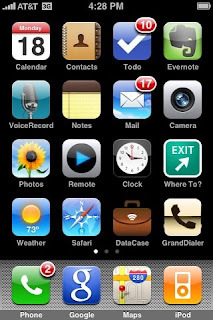 (Very much like Palm -- in fact ToDo.app is pretty much a functional clone of the original Palm To Do app). There are no alerts or alarms on tasks. It's crashed once in light use. Update 9/22/08: I'm a regular Appigo ToDo.app customer. It's a great product, but there's a scary specter looming. Ive been intermittently using the ScribeFire: a Firefox extension blog editor for about a year. The "release fast and often" strategy is fashionable now, but ScribeFire is a good counter-example. It still only shows recently used "labels"/"categories" from blogger. It still doesn't handle blogger's line wrapping correctly. These aren't subtle things, and they aren't new. They've been present from day one. Windows Live Writer is proof that, given sufficient genius, these problems are solvable . Release often is not a panacea. WLW is also proof that there's life at Microsoft. Nobody has released anything comparable for OS X.
I'm trying to move my Outlook tasks into Toodledo, and finding a meaningless "proxy error" (my XP firewall is off) when I try to use the Toodledo Sync Application to get my tasks to Toodledo, and thence to the iPhone ToDo.app. This is way too cutting edge for my sleep needs. Synchronize Outlook Tasks with iPhone. Using 11 years of Microsoft Outlook synchronization experience, KeyTasks provides the most reliable wireless Outlook Tasks synchronization available for the iPhone and iPod touch. The KeyTasks synchronization is provided through your MyChapura Account. A MyChapura account is included with your yearly subscription of KeyTasks. MyChapura is an online service that provides "cloud" synchronization of Microsoft Outlook Tasks and KeyTasks on the iPhone or iPod touch. MyChapura stores your information on our Web servers. This is commonly referred to as the "cloud." When you make a change in Outlook or on your device and synchronize, that change is sent up to the cloud. Your iPhone or iPod touch will receive this change when you synchronize and your PC can be configured to manually or automatically synchronize. This allows you to keep your information current in multiple places no matter where you are. I'm getting a dawning sense of horror. I've spent about 10 years fighting with Palm/Outlook synchronization.. It's been a greater battle than hacking WordPerfect hex files to make my printer work, or futzing with obscure Hayes commands to get my 2400 bps error-correction enabled. I've learned a lot about synchronization from Chapura, and it's all been painful. I must admit though, that while their Palm KeySuite is dumb and ugly, the current version does work. 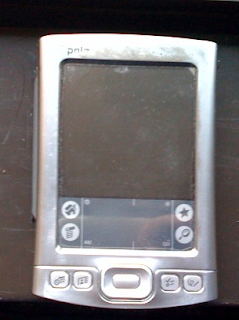 I regularly sync my decrepit Palm to Outlook 2003 and it hardly ever blows up. So I can believe that Chapura might get the Outlook to iPhone connection working better than Apple, Google or anyone else. Unfortunately I'm also confident that their corresponding iPhone task app will be very ugly. Which brings me to the sense of horror. If Chapura follows past practices, they'll create a suite of apps for the iPhone that will mirror those on Outlook. They'll be ugly but reliable. I might end up replicating what I do now on my Palm. Sync from home to native iPhone apps, and from work to Chapura's future suite.